This argument uses temperatures from the top of the Greenland ice sheet. 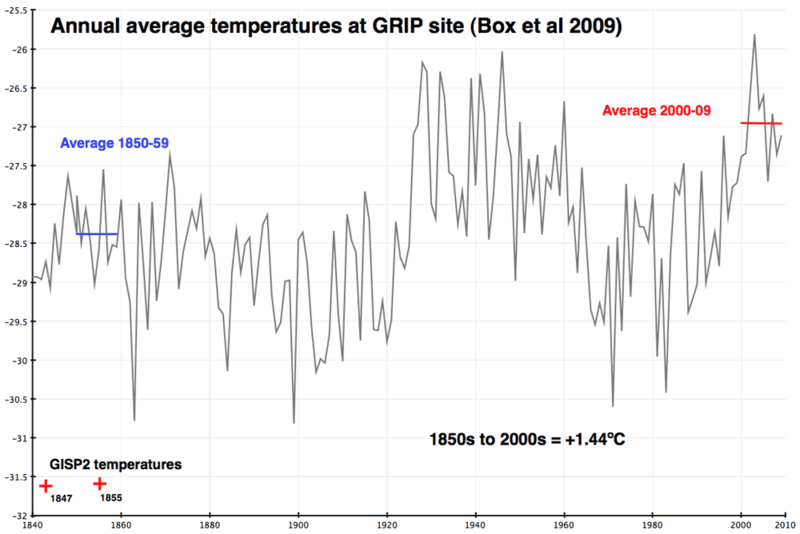 This data ends in 1855, long before modern global warming began. It also reflects regional Greenland warming, not global warming. 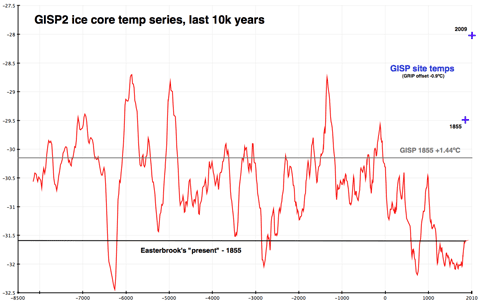 This argument is based on the work of Don Easterbrook who relies on temperatures at the top of the Greenland ice sheet as a proxy for global temperatures. That’s a fatal flaw, before we even begin to examine the use of the ice core data. A single regional record cannot stand in for the global record — local variability will be higher than the global, plus we have evidence that Antarctic temperatures swing in the opposite direction to Arctic changes. Richard Alley discussed that in some detail at Dot Earth last year, and it’s well worth reading his comments. Easterbrook, however, is content to ignore someone who has worked in this field, and relies entirely on Greenland data to make his case. Easterbrook plots the temperature data from the GISP2 core, as archived here. Easterbrook defines “present” as the year 2000. However, the GISP2 “present” follows a common paleoclimate convention and is actually 1950. The first data point in the file is at 95 years BP. This would make 95 years BP 1855 — a full 155 years ago, long before any other global temperature record shows any modern warming. In order to make absolutely sure of my dates, I emailed Richard Alley, and he confirmed that the GISP2 “present” is 1950, and that the most recent temperature in the GISP2 series is therefore 1855. The GISP2 series — the red line — appears to be identical to Easterbrook’s version. The bottom black line shows his 1855 “present”, and it intersects the red line in the same places as his chart. 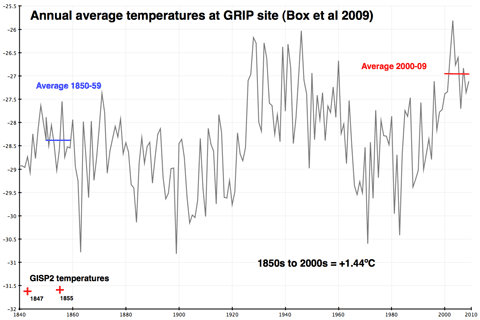 I’ve added a grey line based on the +1.44ºC quantum calculated from the GRIP temperature data, and two blue crosses, which show the GISP2 site temperatures inferred from adjusted GRIP data for 1855 and 2009. 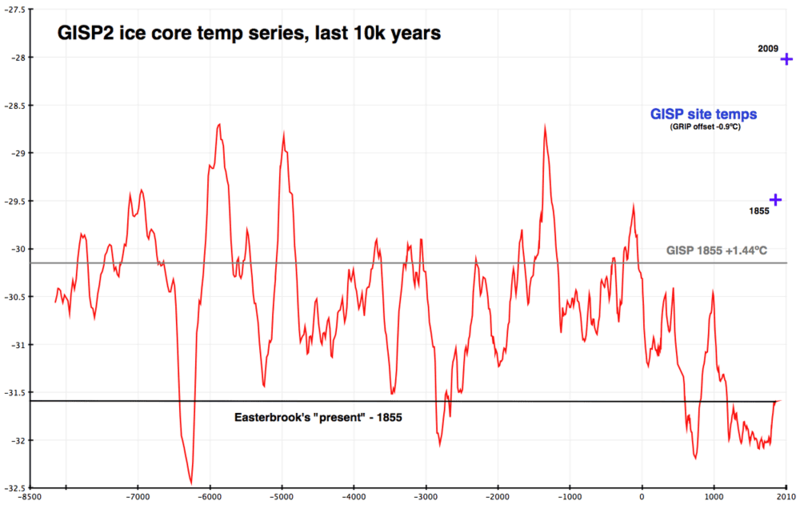 1855 — Easterbrook’s “present” — was not warmer than 1934, 1998 or 2010 in Greenland, let alone around the world. 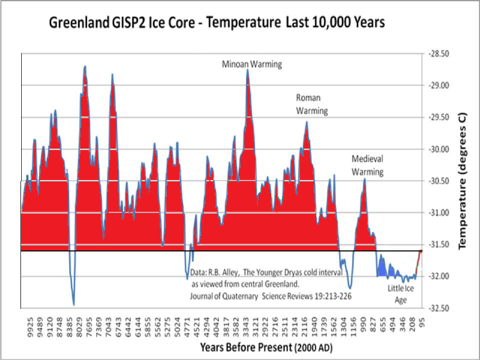 His claim that 9,100 out of the last 10,500 years were warmer than recent peak years is false, based on a misunderstanding or misrepresentation of data. "Whether temperatures have been warmer or colder in the past is largely irrelevant to the impacts of the ongoing warming. If you don’t care about humans and the other species here, global warming may not be all that important; nature has caused warmer and colder times in the past, and life survived. But, those warmer and colder times did not come when there were almost seven billion people living as we do. The best science says that if our warming becomes large, its influences on us will be primarily negative, and the temperature of the Holocene or the Cretaceous has no bearing on that. Furthermore, the existence of warmer and colder times in the past does not remove our fingerprints from the current warming, any more than the existence of natural fires would remove an arsonist’s fingerprints from a can of flammable liquid. If anything, nature has been pushing to cool the climate over the last few decades, but warming has occurred. See also: MT at Only In It For The Gold. My thanks to Richard Alley and Jason Box for their rapid response to my questions. NOTE: This rebuttal is an edited version of a blog post first published by Gareth Renowden at Hot Topic.